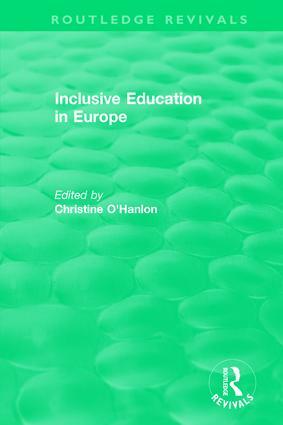 Originally published in 1995, this book offers a crucial view of the implementation of legislation for the integration of pupils with special educational needs in EU countries at the time. The match or mismatch between the rhetoric and reality, between the policy and the practice are reviewed by presenters from a recent appraisal of progress in individual national contexts. Authors are critical of the situation in their own countries and call upon recent and relevant research sources to support their views. The relationships between particular themes in the education of pupils with special needs are observed and compared in a broad European context. The Contributors. Preface. Introduction Patrick Daunt 1. Denmark Susan Tetler 2. France Felicity Armstrong 3. Germany Dirk Randoll 4. Greece V. Lampropoulou and S. Padeliaudou 5. Ireland Patricia Lynch 6. Italy Irene Menegoi Buzzi 7. The Netherlands Kees Den Boer 8. Portugal Ana Maria Bernard da Costa 9. Spain Carmen G. Pastor 10. UK Christine O’Hanlon 11. Belgium A. Dens and E. Hoedemakers.